The recipe yielded a deeply flavored, hearty dish, but it left we wondering why Werle titled it ”alla cacciatora,” or in English “in the style of the hunter’s wife” as opposed to “cacciatore,” or “hunters style.” I always thought the moniker derived from the ingredients a hunter could easily find and put together while on the chase. 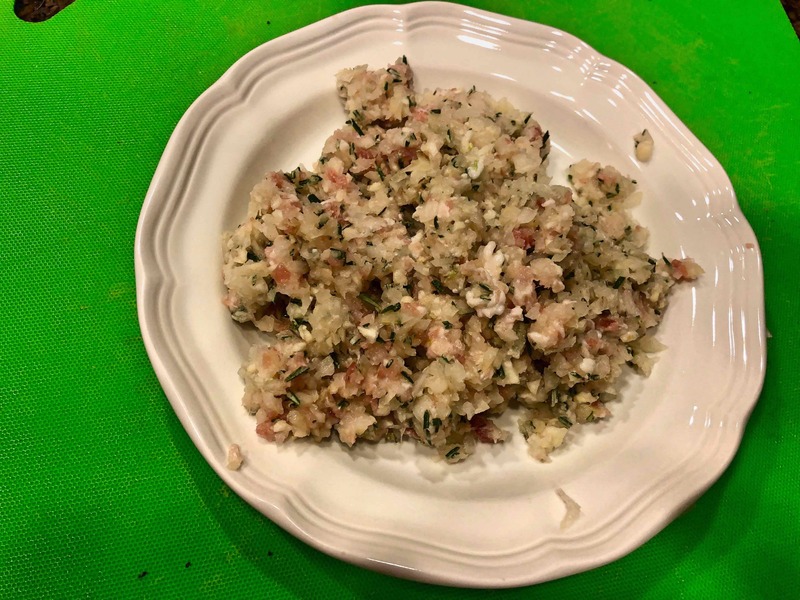 Yet the more I read about this famed dish led me to believe that the proper term for it may indeed be the one crediting the wife, who would make a hearty dish to sustain her husband as he hunted. In fact, the tomatoes we often associate with the dish were probably not part of the original as they came to Italy from the New World, an event that postdates its origins. You can read more about these matters here. 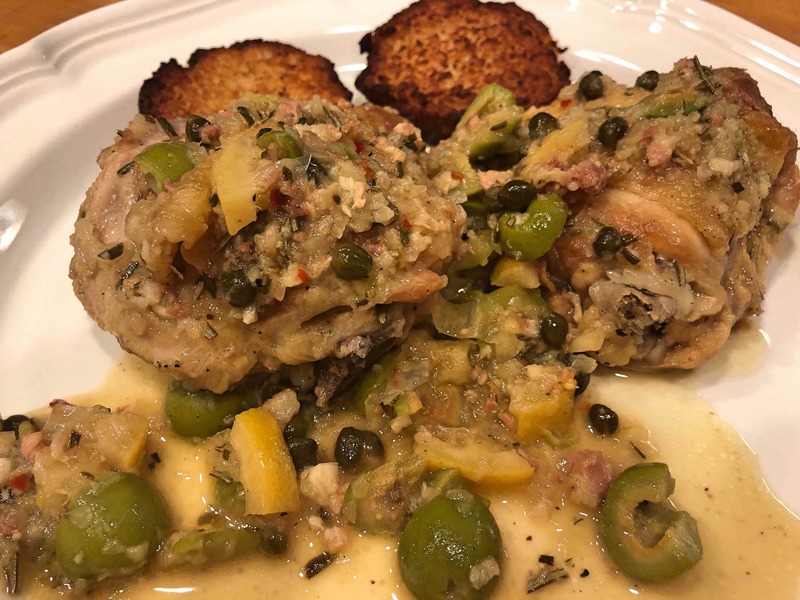 I made a few changes to Werle’s recipe, mostly increases to the amounts of pancetta, rosemary, capers, lemon slices, chili flakes, and olives. I also prefer to season the chicken on the underside before browning rather than after. In the future, I might try adding some whole black olives, like kalamatas. As it was the last night of Hanukkah, out of deference to my better half, I decided to serve the dish with potato pancakes, but polenta might be a more traditional accompaniment. 1) Season the chicken with salt and pepper. 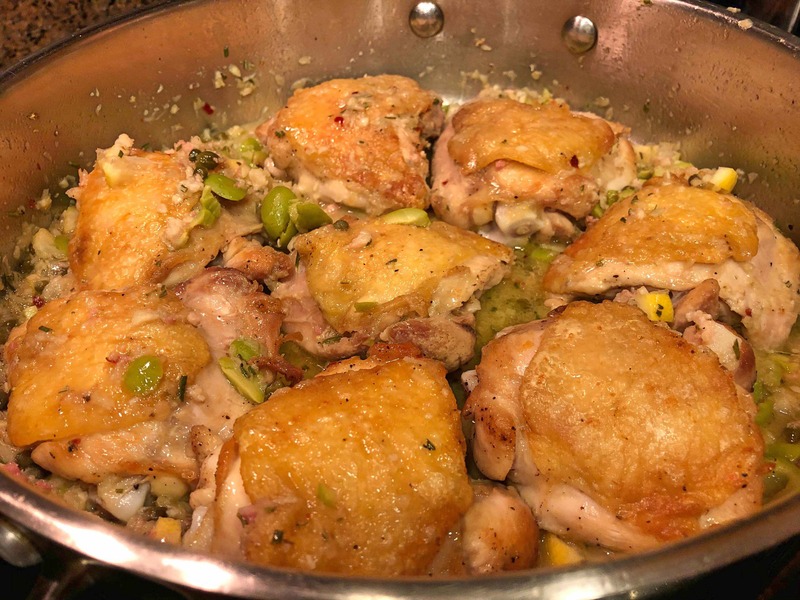 2) Choose a pan which can hold all the chicken pieces in one layer, without crowding. Warm the oil over moderately high heat. 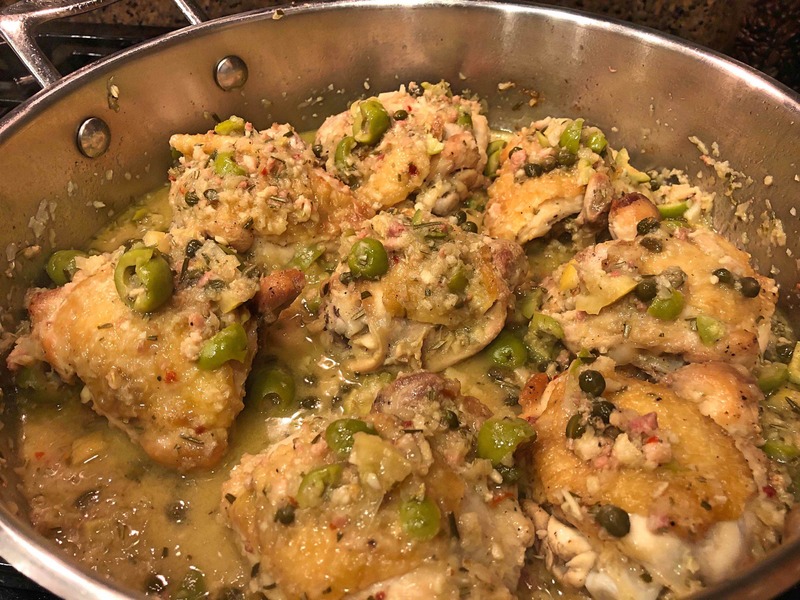 3) When hot, add the chicken pieces, skin side down (if the pan is not large enough, do this in two batches). Brown the chicken on both sides, about 10-15 minutes. 4) Transfer to a large plate. 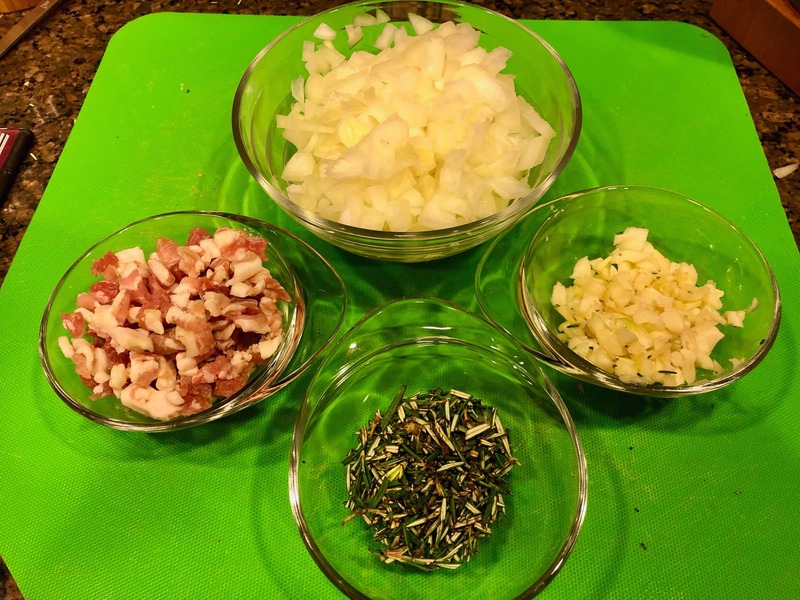 5) Combine the pancetta, onion, rosemary and garlic in a small processor and pulse until finely chopped. 6) Drain all but 3 tablespoons of the fat from the pan. 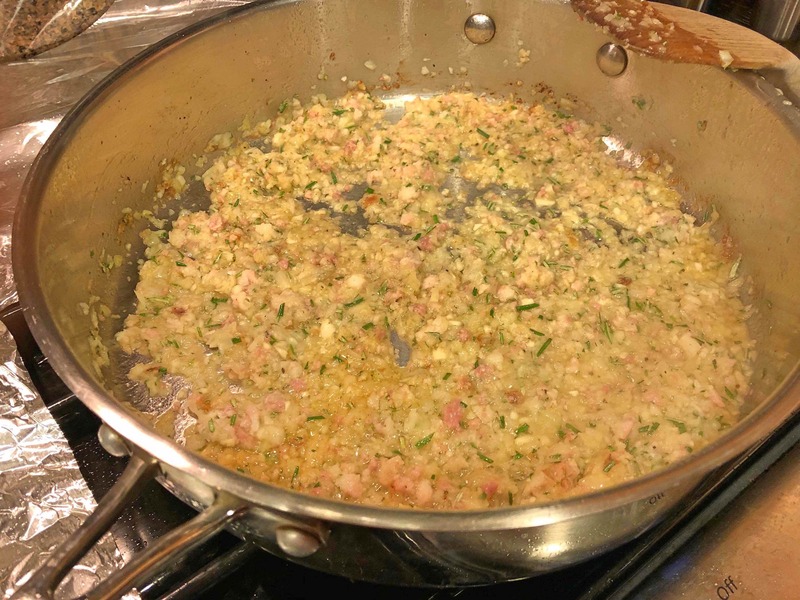 Add pancetta mixture and sauté over moderate heat for 5 minutes. 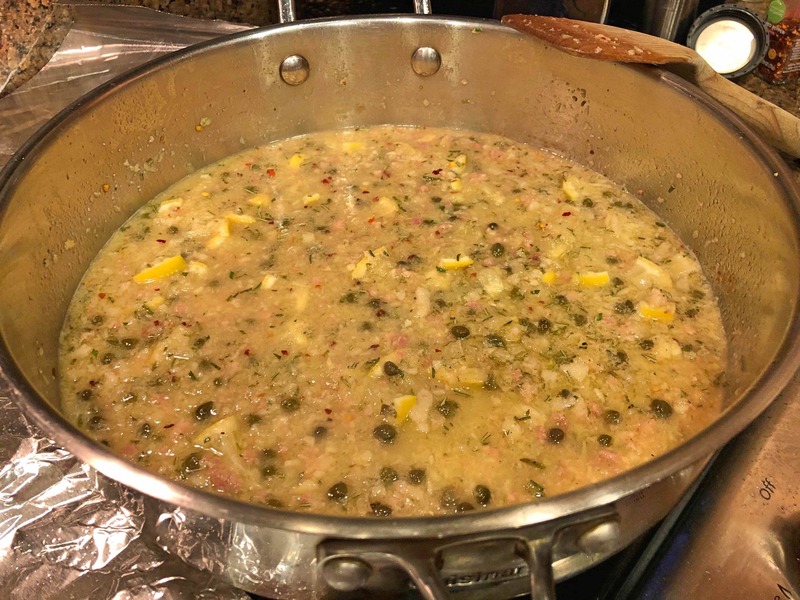 7) Add the wine, vinegar, capers, lemon and chili flakes. Bring to a boil, scraping any browned pieces from the bottom. 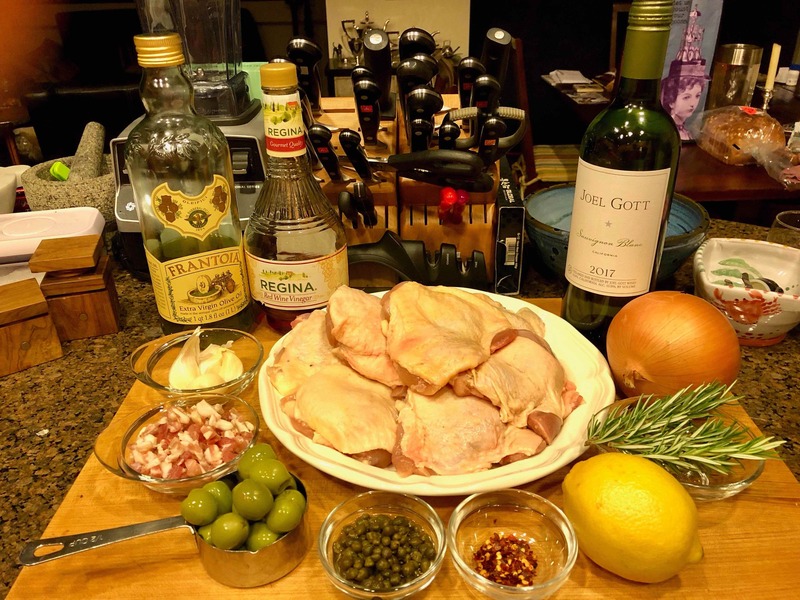 8) Return the chicken, with any juices accumulated on the plate, to the pan and stir in the olives. 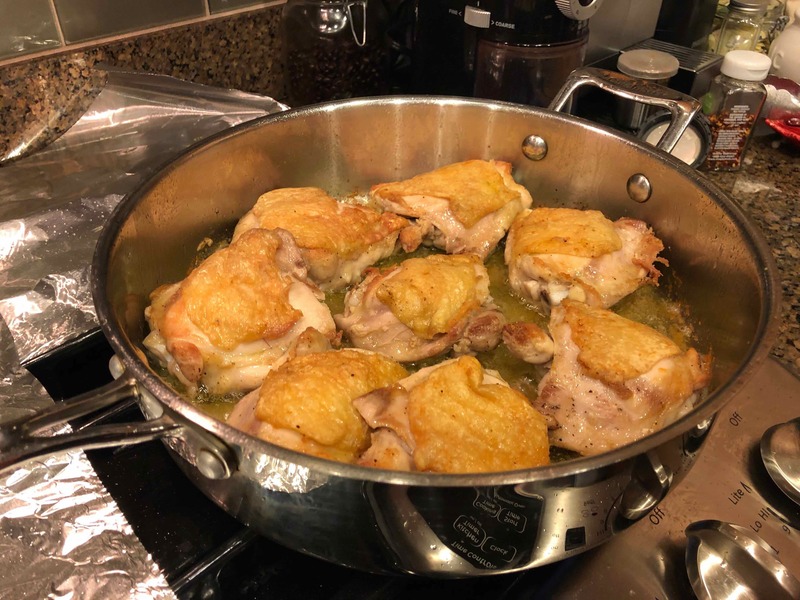 9) Cover with a lid set at a slight angle and cook over a low heat until chicken is tender, about 25 minutes. The chicken is cooked when the juices run clear, and not pink, when a thigh is pierced with a skewer. Add a few tablespoons of water if the pan becomes dry. Transfer the chicken to a warmed platter and pour over the sauce. If the sauce is thin, briefly reduce over high heat.